One of 6 products to be shortlisted for Product of the Year. “BlephEx™ is a very useful addition to the lid hygiene / dry eye armamentarium. The device effectively clears debris from the lashes and lid margins and to my surprise contributes to down-regulating inflammation along with a subjective improvement in symptoms. I can only conclude that lid debris contains toxins that contribute to inflammation. BlephEx™ is an effective device for cleani... Read more. “Intuitively, BlephEx™ is the treatment blepharitis has been calling for in combination with OcuSoft plus I am seeing excellent results” Read more. “Blepharitis is a common, recurrent eyelid condition that can cause eye discomfort and dryness symptoms. The BlephEx is a revolutionary device which allow rapid relief from these symptoms and I would recommend using this on all patients for safe and effective treatment." Read more. "BlephEx is an exciting new device that is working well for my blepharitis cases. I have had it in the practice for nearly 2 months and I am recommending the procedure to all suitable blepharitis patients. I have been pleasantly surprised by the results with the device and I now feel that I am finally doing something really useful for these patients in practice." Read more. "My experience with BlephEx to date has been fantastic.” Read more. 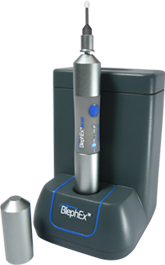 “BlephEx is a great tool to remove scales and debris found in moderate to severe blepharitis. It is an important part of our dry eye protocol. Our patients find the procedure easily to tolerate and report a significant improvement in the eyes following the procedure. BlephEx has changed the way we treat seborrhea type blepharitis.” Read more. “BlephEx treatment has been a marvellous addition to our armamentarium for the management of blepharitis, meibomian gland disease and other forms of ocular surface anomalies. The procedure is comfortable, easy to perform and highly effective.Our experiences with BlephEx treatment have been quite impressive in the management of both clinical findings and subjective symptoms when used in conjunction... Read more. “After years of struggling with patients with significant amounts of blepharitis, I now find that I can virtually eliminate the presence of active blepharitis discharge with the BlephEx procedure. Patients tell us that they feel like we have given their eyelids the best massage ever but therapeutically, it works to jump start the blepharitis treatment protocol. Patients are happy as the irritation... Read more. “I see at least three or four patients every morning who have a blepharitis related complaint. If I look carefully under high slit lamp power, I invariably find evidence of Demodex, even if it is only slightly swollen lash orifices with tiny protuberances that looks like a small tails. Upon examination of these lashes under a microscope, I have always found living or dead Demodex. Every one of my ... Read more.